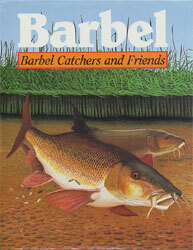 The Catchers 1st Book "Barbel - Barbel Catchers and Friends"
When it was published in 1988 “Barbel” was one the earliest books written by and for barbel anglers. It appeared at a time when dedicated barbellers could be counted in hundreds as opposed to the probable thousands that pursue the species currently. Of course, the opportunities for catching Barbus Barbus were far more limited in those pioneering days, as evidenced by the fact that the book has only fifteen chapters on rivers compared to the twenty nine of the current book, “Barbel Rivers and Captures”, and such was the predominance of The Royalty fishery it qualified for a chapter of it’s own, whilst the Yorkshire rivers, Thames and Severn tributaries and minor rivers were all confined to just a chapter apiece! It's amazing to think that the mighty river Wye was then only of minor importance and Kent’s Medway receives no mention at all, yet within a few years of the books publication it was turning up the biggest fish in history. ween, hence the emphasis on venues and tactics rather than the capture of specimens. Also of interest is the chapter regarding Stillwater barbel which is treated as a serious branch of barbel fishing , free of the misgivings the most of have today – how times have changed! The Catchers 2nd Book "Barbel Rivers and Captures"
There have been revolutionary advances in barbel fishing since the publication of Barbel by the Barbel Catchers Club (BBC) published by the Crowood Press in 1988, and the BCC has been at the forefront of these dramatic developments. This long awaited, and entirely new volume written by BCC members comprehensively covers the modern barbel fishing scene, discusses the size of the fish now caught and illustrates the changes that have taken place in tackle, tactics and baits. There are individual chapters on each major barbel river in England from the smallest streams, such as the Lodden and the Holybrook, to the mighty Midlands rivers, the Trent and the Severn, to the Yorkshire spate rivers and the crystalline waters of the famous Hampshire Avon. Each river chapter is written by an experienced angler with proven success on the river in question and culminates with a fascinating account of the capture of a really special barbel weighing in excess of 10 lb. This remarkable book provides a wealth of expert information and explores not only traditional fishing methods but also ground-breaking new ideas. Lavishly illustrated with 200 images including photographs, drawings and diagrams, and a colour-plate section, this is an indispensable volume for both the barbel enthusiast and general river angler alike. Barbel Rivers and Captures is written by the Barbel Catchers Club and provides a vast amount of information about the contemporary barbel-fishing scene. 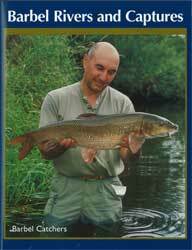 Written by experts, it comprehensively covers all the major barbel rivers in England. Details of the Barbel Catchers Club River Records and the Clubs 'top fifty' barbel. I recently bought a copy of your clubs latest book and felt I should write to you to tell you how much I enjoyed it. As an on and off barbel angler I always like to keep up with current publications and this book was a pleasure to read. The layout and style are excellent and the quality of writing is of a high overall standard. Although I realise it is not a "how to do it" book I think I have picked up on a number of things that will be very useful to me when I switch to the rivers later in the summer. I do most of my barbelling on the Dane but in the past I have taken fish from the Severn, Teme , Avon and Ribble, nothing spectacular but fun nonetheless. The down to earth approach of your members and the realistic attitude they show towards their fishing was a breath of fresh air, a nice change from "tackle tarts" and the "barbel police". Once again thanks for a great book. What can I say about this book? It is awesome! 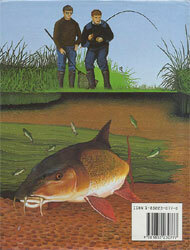 Written by Anglers for Anglers and every bit as good as the previous Barbel Catchers book, if not better. There is a brief introduction, explaining the reason for the book. A chapter on boilies and baits and some advice re the advances. Then there are 14 chapters devoted to 14 different rivers, all of which have produced double figure barbel to members of the club. 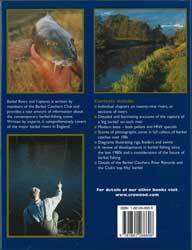 Each chapter is written by a member of the BCC and the "end" part of each chapter is written by the member who holds the "Club" record for that river, describing the "records" capture. Make no bones about it, with the exception of the "Cherwell" chapter, which is written by Tony Miles, there are few if any "household" names writing here. It is all just good honest stuff. It is not a book about rigs methods and where to fish. Each chapter starts with the river in question being described from its source to sea or where it joins another river. Barbel density is looked at in the various rivers and general areas that contain fish. The relevant author then describes his approach and how he gathers his information. Beleive me they dont give the game away, but they do give you an insight into how they go about things and what works for them. Do not think that the BCC is elitist like some specialist groups. They have maintained a membership of around 50 since their inception, and every member is expected to write at least 1 article a year for their quarterly mag "Barbus", but they are just regular anglers, with a few exceptions. They havent caught the biggest barbel in the world and are in no way "big headed" in any sense of the phrase. In fact I have caught bigger barbel on one or two of the rivers covered. The book is superb, I recommend it unreservedly and somehow I am envious that I am not a member! Well done the BCC on a superb work, and dont leave it so long till you produce another, I have read this one twice already!